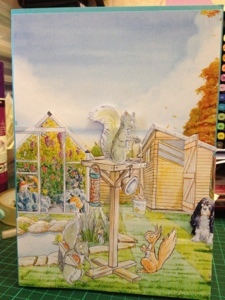 Well I have been busy this month and not been able to get any cards done. But I could let my husband's birthday go by and not make him a card and also a wedding anniversary card as it is our 6th wedding anniversary. I made our wedding anniversary card using my Docrafts tatty ted digital designer cd rom. 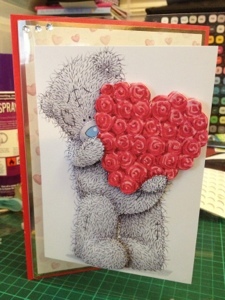 Acetate, mirri card, gems backing sheet and decoupage tatty bear. I had to make a card from the boys and they chose this image as they said it is so like that lol. I have used the same cd rom as the card I made. Good to see you back again! 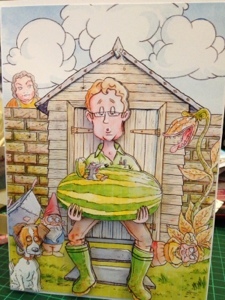 Three great cards - love the shed and the garden ones - real fun cards. what great cards love them.